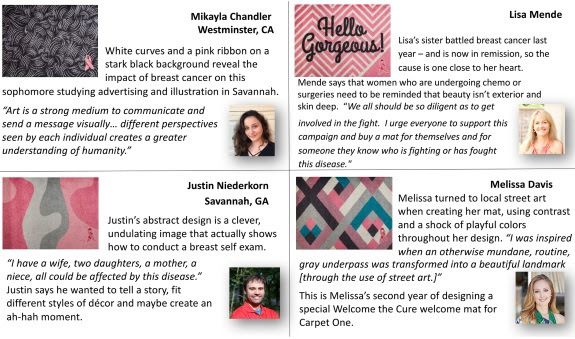 Carpet One Floor & Home's is continuing to support breast cancer research with the addition of four edgy, thought-provoking designs joining the 18 welcome mats in their 2017 "Welcome a Cure Pink Ribbon" Mat Collection. For each $24.99 ($34.99CDN) 2'x3' US-made, rubber-backed mat sold, 25 percent of the proceeds goes directly to help the five-star rated Breast Cancer Research Fund. 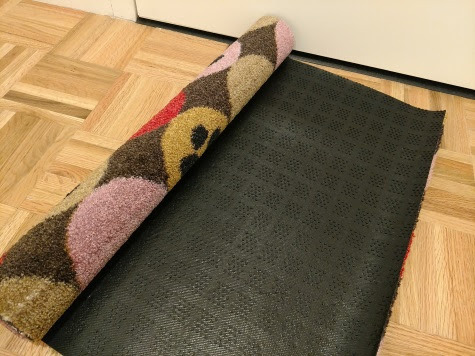 Each Mat has a unique design. As you can see the designers behind the latest four chose their mats pattern for special reasons. How amazing is that. As a thank you for sharing the information about their "Welcome a Cure Pink Ribbon" Mat Collection, I received one of Carpet One mats. I thought this was a great way to spread awareness about this initiative and keep my floors clean when guests come over. 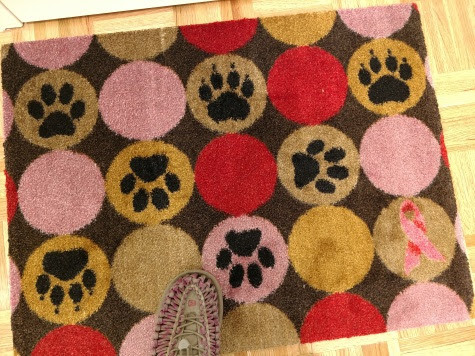 I chose the "Pets Welcome" mat because of the stylish pattern and the cute paws. It looked great in my hallway. It mat is really great quality with a textured back, so it stays put. No slipping. It also has a nice large area to fit a good amount of shoes. Gotta keep your floors clean! I think any of the Carpet One "Welcome a Cure Pink Ribbon" Mats would look great in any home. Buying one of these mats is more then just about decorating your home. Each time you see the mat, you'll know you helped to fund research that can save someone's life. Entries must be made on or before 11:59 p.m. October 9, 2017. If I could make a welcome mat, I'd like to make one with a fence design over top of flowers. A sunrise, for a new day after defeating cancer. Congratulations to you! Best wishes for good health moving forward. If I could design a mat I would use stick figures to represent each member of our family! 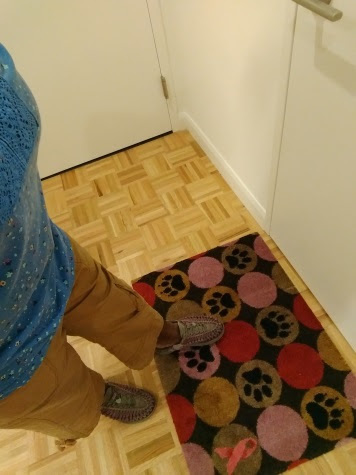 I like the pawprints since I have many pets. I would have a kitty paws one since I support my local animal shelter. My welcome mat would be Hummingbirds because they are my favorite bird. I would actually do a craniofacial (cleft palate/cleft lip ) awareness mat. I would love to make a mat of pictures of cats and dogs to raise money for animal shelters. I would make a mat with cute writing that says hello in different languages because I love to travel. I would make a mat with primitive crows and sunflowers on it!! Black background and bright colored sunflowers! I would probably make a mat with some sort of Celtic symbol on it to honor my family's ancestry. I like the Paw print mat the best. My sister has a mat that says "Welcome" when you are walking in and says "Goodbye" when you leave. I would design one similar to that. Mine would probably say WARNING: Cat fur ahead! Haha. I would make a funny baseball rivalry mat. I am a White Sox fan and my husband is a Cubs fan so that would be fun. I would make one that symbolized unity and love. I think one with sunflowers on it would be nice or one with a Christmas scene. I would make my design about welcoming! All of these are just so cute!! lindsayhess84 at yahoo dot com. I would like to design a horse mat. If I could make a mat, I'd design something with a nautical theme, like a simple anchor, or something with blue stripes. Mine would have my families last name on it, but i would probably have the white cancer ribbon on it because I love the idea of it, it's a beautiful gesture. I like the Hello Gorgeous one. I would like one that said "Stardust" to remind us that we are one with the universe and made up of the elements of stars. If I could make a mat, I'd make a welcome mat with human and dog footprints. I'd make a mat with the design of Van Gogh's Starry Night on it. I would make a mat with cat paws on it. Oh I would love to make one with wind turbines for our little one. He is so in love with them....I would love a mat with those on it! It's so hard finding a cute, yet durable, welcome mat! These are just ADORABLE! I like botanical/leafy designs best. I would make a mat with cucumber vines. I think I would do a design with peace signs or maybe haunted houses, so many ideas. I'm really mandalas lately, having one on a mat would be pretty! If I could design my own welcome mat, I would design one with a picture of my dog on it. I would create one with a celtic knot. If I could design a mat I would have beautiful tulips with a breast cancer ribbon. I lost my Mom To stage 4 breast cancer last year and her favorite flower was tulips! I'd design a mat with a pack of wolves along a hill during the nighttime. Thanks. I would like a tree on mine, maybe a purple weeping willow in a field of wildflowers. I'd love to make a organic/non gmo mat. Change your diet, change your life. I would make a mat with cats on it. I would make one with a corgi on it. I would make a mat with a photo of my 3 dogs. I would make a beach mat with crabs or an anchor on it. My mat would feature a family of foxes in a field. I would put in the words Enter a friend, Leave Family. I would make one with lots of kittens and puppies playing together. I would make a mat with a picture of a Sheltie. I love the Pets Welcome mat. Would like a football door mat. I love the Watermelon Breast Cancer mat. Very cute and with purpose! I would make a purple one with the flower for pancreatic cancer (it slips my mind what flower right now) in honor of my sister who passed away from pancreatic cancer last June. My husband had testicle cancer and my grandma passed from colon cancer so I'd like something to honor them both. I would make one with a beagle on it. I would like a mat that looks like a tye-dye pattern. I would make one tat represented two NFL teams on the same mat. His and Hers. I'd make a mat with a colorful quilt block pattern. I like the sports them designs the most, and go Chicago teams.